Player of the year Liam Welham HAS signed a new deal for 2016. The future of the influential centre had been the subject of much speculation over recent weeks but the Dons have reassured fans that the 26-year-old is on board for next season. Welham, 26, was Doncaster’s stand-out player last season and won four individual awards at the end of the campaign. 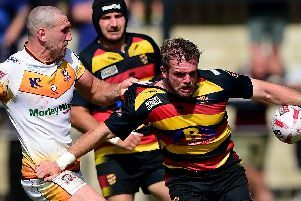 “It got announced a little early, I had a gentlemen’s agreement with Carl Hall and he wanted to announce the deal as soon as possible to get the fans on board,” Welham told the club’s official website. “The fans got a bit upset recently and they were calling Carl out, but he didn’t lie one bit, it was a gentlemen’s agreement. “We just had a few teething problems and contractual issues if you like, but we have now agreed terms and it is official I have put pen to paper and I am a Doncaster player for 2016. “I stuck to my guns and I wanted to do business after the season had finished because I think it can have an adverse effect on the pitch,” he added. “It was very pleasing to be wanted. “Gary (Thornton) came to me with four or five games remaining and it was very nice and a good feeling that I was approached first, so that was a massive boost. “Obviously with all the accolades I got at the end of the season that was another incentive to stay.